As a first-generation college student, Caitlin Rosario Kelly, program manager for educational access and equity at the Dartmouth Center for Social Impact, didn’t have access to the resources she needed to navigate the college application process. To help students in the Upper Valley faced with similar challenges, SEAD — a college access program that connects first-generation low-income high school students with Dartmouth undergraduates — recently shifted its focus to students from Upper Valley high schools, specifically Hartford High School, Stevens High School and Rivendell Academy. On Jan.18, the 22-year-old West Lebanon man charged with the non-fatal shooting of a visiting Providence College student near campus last fall was indicted on four new charges relating to the Nov. 2 incident. The man, Gage Young, has pled not guilty on all charges and is set to return to court for a pretrial hearing on Feb. 27. The last disposable to-go container “walked out” of the Courtyard Café on Feb. 3. Starting Monday, anyone ordering something to-go at the Courtyard Café grill station will be required to buy a reusable Green2Go container. Black Legacy Month celebrations kicked off on Saturday evening at Collis Common Ground with food, prizes and performances from student groups on campus. February marks Black Legacy Month at the College, and Dartmouth will be hosting celebrations and events throughout the month to honor black history and celebrate the continuation of its legacy. Physics and astronomy professor James LaBelle is an experimental space plasma physicist who has been at Dartmouth since 1989. After losing its “R1” status in 2015, the College regained the top research classification determined by the Carnegie Commission on Higher Education in its latest report. World-renowned mountaineer, accomplished lawyer and former Dartmouth Outing Club director Andy Harvard ’71 brought a boundless energy and infectious zeal to every challenge he took upon himself. Then, at the age of 59, an Alzheimer’s diagnosis dealt him a devastating blow. With hopeful prospective ’23s having just submitted their applications to the College, planning for the Dartmouth Outing Club First-Year Trips program for 2019 is well underway. Trips director Maddy Waters ’19 and assistant director Dorothy Qu ’19 have been joined by a directorate of 10 Croo Captains and 10 Coordinators. Although the debate surrounding the longest federal government shutdown in American history is centered in Washington, D.C., the effects have been felt in the Upper Valley and specifically Hanover, according to Hanover town manager Julia Griffin. Jedidah Isler is a first-year professor of physics and astronomy at Dartmouth. She studies particle acceleration and blazars — enormous black holes that shoot high-energy jets of particles — and is dedicated to furthering the positions of women of color in STEM fields. In addition to being the first African-American woman to earn a Ph.D. in astrophysics from Yale University, she is the founder of Vanguard STEM — a live, monthly web-series that features a panel of women of color in STEM discussing anything from research to advice. “One” long awaited dining event occurred last night at the Class of 1953 Commons, starting at 4:30 p.m. and running throughout dinner until 8 p.m. The dinner was designed to expose members of the College community to local restaurants and eateries through the addition of dishes from various local restaurant menus to ’53 Commons for the night. Those who appreciate downtown Hanover’s charm might be distressed this winter by the recent closures of several long-time small business staples. 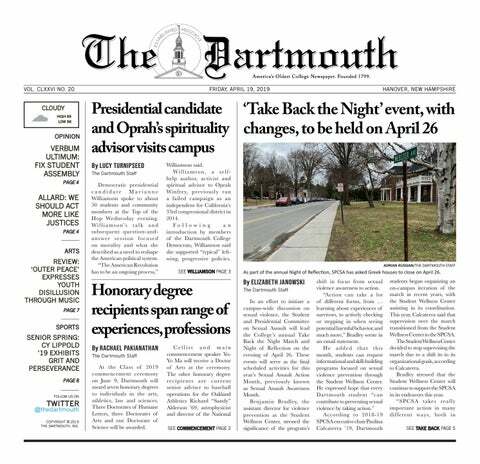 The Dartmouth Bookstore, Canoe Club restaurant, and the clothing retailers Folk and Rambler’s Way have all permanently shut their doors in the past few months, falling victim to a trend that has made some Hanover merchants uneasy about the future. Over 75 athletes gathered at the Dartmouth Skiway for the 17th annual Upper Valley Special Olympics on Jan. 26. This year, 140-plus total volunteers – over 75 of them Dartmouth students – supported the athletes. Margaret Olivarez, a third-grade teacher at Copperfield Elementary School in Austin, Texas, wanted to get her elementary school students to be involved in the school district’s “College Shirt Wednesdays,” an initiative designed to frame higher education as a real possibility for underprivileged students. The Dartmouth registrar, along with more than 30 other universities, helped make this task a little easier by donating a much-needed supply of t-shirts.